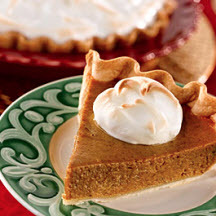 Skip the whipped cream and surprise your family and guests with a meringue-topped pumpkin pie! For Pumpkin Filling: Beat together pumpkin, egg yolks, sugar, condensed milk, spices and salt until smooth. Pour into pie shell and bake at 400°F (205°C) for 10 minutes; reduce heat to 350°F (175°C) and continue to bake until knife inserted near center of pie comes out clean or about 50 to 60 minutes. Reduce oven temperature to 325°F (160°C) when pie is done. Bake at 325°F (160°C) until meringue becomes golden brown on top or about 20 to 22 minutes. Chill before serving. Refrigerate leftovers.